Jaime Teevan and Susan Dumais. "Web Retrieval, Ranking and Personalization." In Ian Ruthven and Diane Kelly (Eds. 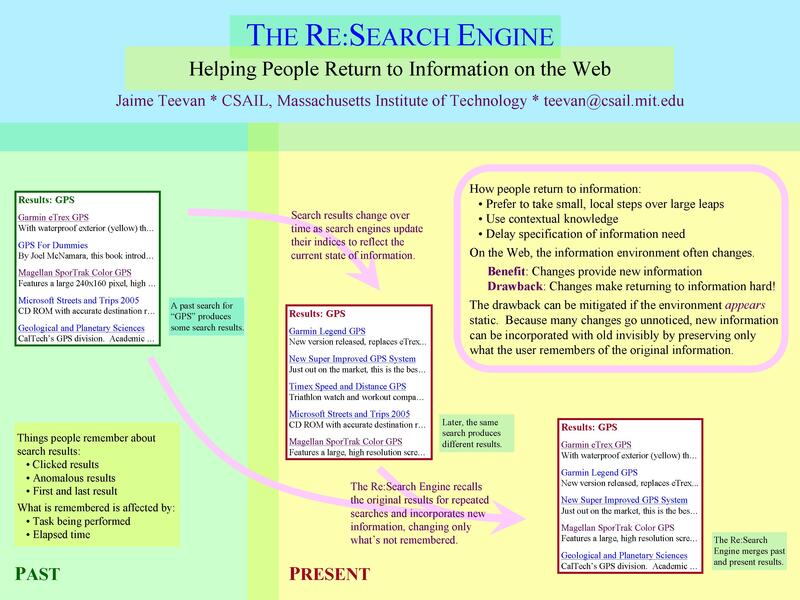 ), Interactive Information Seeking, Behaviour and Retrieval. London: Facet Publishing, 2011. Jaime Teevan, William Jones and Benjamin B. Bederson (Eds.). Special Issue on Personal Information Management. Communications of the ACM (CACM), 49(1), January 2006. Jaime Teevan, Meredith Ringel Morris and Shiri Azenkot. Supporting Interpersonal Interaction during Collaborative Mobile Search. IEEE Computer special issue on Collaborative Information Seeking, 47(3), 2014. Edward Cutrell, Susan T. Dumais and Jaime Teevan. Searching to Eliminate Personal Information Management. Communications of the ACM (CACM), Special Issue on Personal Information Management, 49(1), January 2006. Peter Organisciak, Jaime Teevan, and Michael Twidale. Asking the Right Way: Design Interventions for Microtasks. In Proceedings of 5th AAAI Conference on Human Computation and Crowdsourcing (HCOMP 2017), Quebec City, Canada, October 2017 (Work-in-Progress). Irene Greif, Paul Luff, Barry Brown, Aleksandra Sarcevic, and Jaime Teevan. Lasting Impact Award: Mobility in Collaboration. In Proceedings of the 2017 ACM Conference on Computer Supported Cooperative Work (CSCW 2017), Portland, OR, February 2017. Robert Craft, Roy Raanani, Kieran Snyder, Jaime Teevan, and Gordon Ritter Machine Learning Wins in Targeted Domains. Emergence Capital 3rd Annual Industry Cloud Forum, October 2016. Saleema Amershi, Julie Kientz and Jaime Teevan. Women in Technology Panel. STEM School, Redmond, WA, April 2014. Jennifer Mankoff, Jaime Teevan, Benjamin B. Bederson and Gregory D. Abowd. 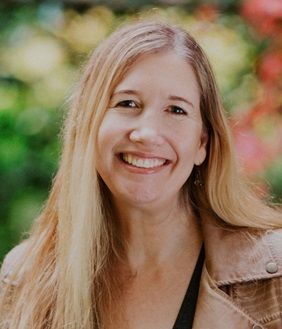 Real Life and Real Work: Real Experiences Negotiating the Competing Needs of Illness, Disability, Children, and Work. The ACM Conference on Human Factors in Computing Systems (CHI 2009), Boston, MA, April 2009. William Jones, Mary Czerwinski, Jaime Teevan, Catherine Plaisant, Thomas P. Moran and Alan Dix. The Challenge of Personal Information Management. The Tenth IFIP TC13 International Conference on Human-Computer Interaction (Interact 2005), Rome, Italy, September 2005. Vanessa Murdock, Jaime Teevan, and Jennifer Neville. Unconventional WSDM: Working Group on Gender Diversity (UWSDM). Diversity event at the Sixth ACM International Conference on Web Search and Data Mining (WSDM 2013), Rome, Italy, February 2013 (Organizer). David Karger and Jaime Teevan. Go to the Source: Capturing User Preferences at the Desktop. The 26th Annual ACM Conference on Research and Development in Information Retrieval (SIGIR 2003) Workshop on Implicit Measures of User Interests and Preferences, Toronto, Canada, July 2003. Jaime Teevan. Automatic Directory Gatherer. The 21st Annual ACM Conference on Research and Development in Information Retrieval (SIGIR 1998) Workshop on Hypertext Information Retrieval for the Web, Melbourne, Australia, August 1998 (Presenter). Note: Slides for talks associated with papers are listed with the paper. Jaime Teevan. Improving Information Retrieval with Textual Analysis: Bayesian Models and Beyond. MIT EECS Masterworks, Cambridge, MA, April 2001. Jaime Teevan, Susan T. Dumais, Michael S. Bernstein, Eric Horvitz, Meredity Ringel Morris, Jin-Woo Jeong, and Daniel J. Liebling. Providing Crowdsourced Answers to Information Needs Presented by Search Engine and Social Networking Application Users. Patent No. 9,424,354. Issued August 2016. Jaime Teevan, Susan T. Dumais, Daniel J. Liebling, and Richard Hughes. Identifying Changes for Online Documents. Patent No. 9,330,191. Issued May 2016. Ryen W. White, Susan T. Dumais, and Jaime Teevan. Domain Expertise Determination. Patent No. 9,268,864. Issued February 2016. Kira Radinsky, Susan T. Dumais, Krysta M. Svore, Jaime Teevan, and Eric Horvitz. Time-Aware Ranking Adapted to a Search Engine Application. Patent No. 9,244,931. Issued January 2016. A.J. Bernheim Brush, John Krumm, Shahriyar Amini, Amy Karlson, Jaime Teevan and Bodhi Priyantha. Mobile Search Based on Predicted Location. Patent No. 9,134,137. Issued September 2015. Eytan Adar, Jaime Teevan, Susan T. Dumais and Daniel J. Liebling. Relating Web Page Change with Revisitation Patterns. Patent No. 9,069,872. Issued June 2015. Ryen White, Susan T. Dumais and Jaime Teevan. Domain Expertise Determination. Patent No. 8,930,357. Issued January 2015. Jaime Teevan, Susan T. Dumais, Gayathri Ravinchandran Geetha and Sarah K. Tyler. 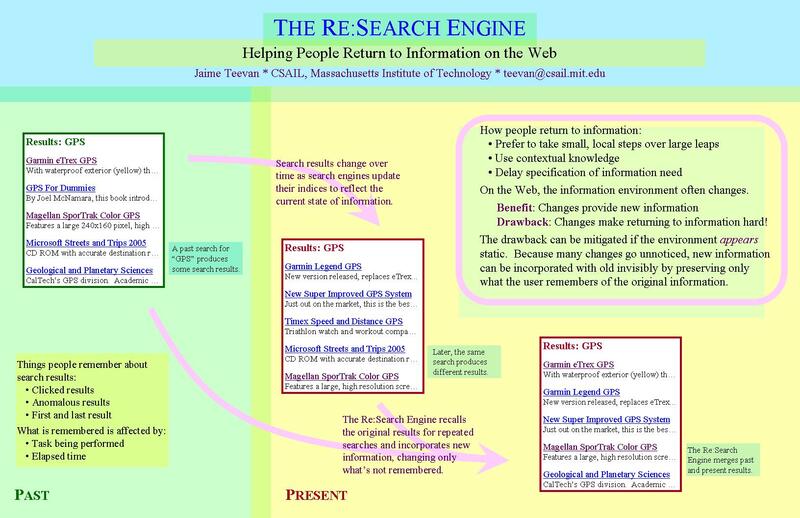 Personalized Navigation Using a Search Engine. Patent No. 8,799,280. Issued August 2014. Jaime Teevan, Susan T. Dumais and Daniel J. Liebling. Document Representation Transitioning. Patent No. 8,584,011. Issued November 2013. Ryen White, Susan T. Dumais and Jaime Teevan. Domain Expertise Determination. Patent No. 8,402,024. Issued March 2013. Meredith Ringel Morris, Jaime Teevan, James W. Mickens, and Saleema Amershi. Using Related Users Data to Enhance Web Search. Patent No. 8,244,721. Issued August 2012. Ryen White, Susan T. Dumais and Jaime Teevan. Domain Expertise Determination. Patent No. 8,122,021. Issued February 2012. Eytan Adar, Jaime Teevan, Susan T. Dumais and Daniel J. Liebling. Relating Web Page Change with Revisitation Patterns. Patent No. 8,078,974. Issued December 2011. Ryen W. White, Susan T. Dumais, and Jaime Teevan. Domain Expertise Determination. Filed September 2016. Jaime Teevan, Susan T. Dumais, Daniel J. Liebling, and Richard Hughes. Identifying Changes for Online Documents. Filed July 2016. Emre Kiciman, Paul N. Bennett, Jaime Teevan, and Susan T. Dumais. Modeling Actions, Consequences and Goal Achievement from Social Media and Other Digital Traces. Filed June 2016. Kira Radinsky, Susan T. Dumais, Krysta M. Svore, Jaime Teevan, and Eric Horvitz. Time-Aware Ranking Adapted to a Search Engine Application. Filed April 2016. A.J. Bernheim Brush, John Krumm, Shahriyar Amini, Amy Karlson, Jaime Teevan and Bodhi Priyantha. Mobile Search Based on Predicted Location. Patent filed November 2015 (Pending). Ryen White, Susan T. Dumais and Jaime Teevan. Domain Expertise Determination. Patent filed March 2015 (Pending). Shiri Azenkot, Meredith Ringel Morris, Jaime Teevan and Daniel J. Liebling. Collaborative Mobile Interaction. Patent filed June 2013 (Pending). Kira Radinsky, Susan T. Dumais, Krysta M. Svore, Jaime Teevan, and Eric Horvitz. Time-Aware Ranking Adapted to a Search Engine Application. Patent filed April 2013 (Pending). Jaime Teevan, Susan T. Dumais, Michael S. Bernstein, Eric Horvitz, Meredith Ringel Morris, Jin-Woo Jeong and Daniel J. Liebling. Providing Crowdsourced Answers to Information Needs Presented by Search Engine and Social Networking Application Users. Patent filed March 2013 (Pending). Jaime Teevan, Carlos Garcia Jurado Suarez, Daniel J. Liebling, Ann Paradiso, Curtis von Veh, Darren Gehring, James St. George, Anthony Carbary and Gavin Jancke. Interactive Presentations. Patent filed November 2012 (Pending). Ryen White, Susan T. Dumais and Jaime Teevan. Domain Expertise Determination. Patent filed March 2013 (Pending). A.J. Bernheim Brush, John Krumm, Shahriyar Amini, Amy Karlson, Jaime Teevan and Bodhi Priyantha. Mobile Search Based on Predicted Location. Patent filed June 2012 (Pending). Eytan Adar, Jaime Teevan, Susan T. Dumais and Daniel J. Liebling. 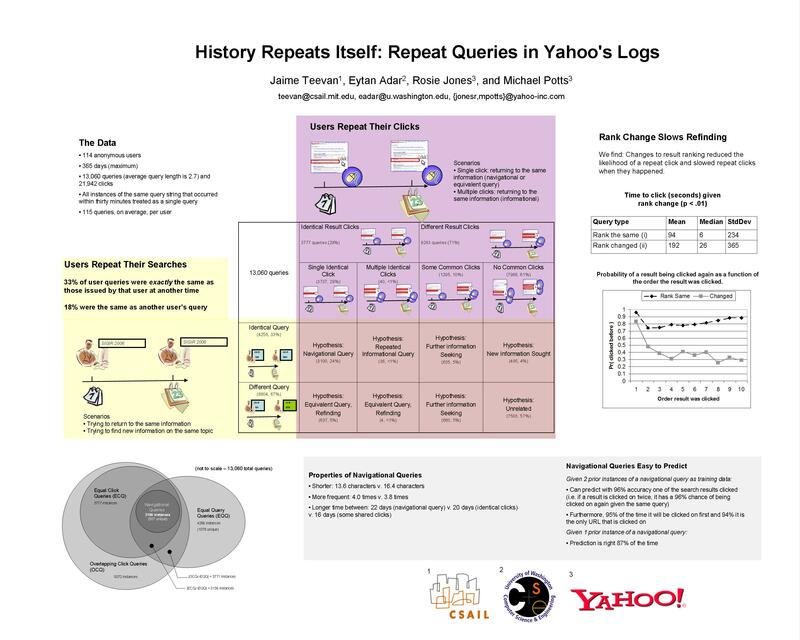 Relating Web Page Change with Revisitation Patterns. Patent filed February 2012 (Pending). Jaime Teevan, Susan T. Dumais and Daniel J. Liebling. Document Representation Transitioning. Patent filed December 2011 (Pending). Meredith Ringel Morris, Jaime Teevan, Brent Hecht and Daniel J. Liebling. Designating Automated Agents as Friends in a Social Network Service. Patent filed June 2011 (Pending). Jaime Teevan, Susan T. Dumais, Gayathri Ravinchandran Geetha and Sarah K. Tyler. Personalized Navigation Using a Search Engine. Patent filed May 2010 (Pending). Ryen White, Susan T. Dumais and Jaime Teevan. Domain Expertise Determination. Patent filed May 2010 (Pending). Meredith Ringel Morris, Jaime Teevan, Katrina Panovich, Aravind Bala, Jonathan Garcia, Susan T. Dumais and Eric Horvitz. Integrating a Search Service with a Social Network Resource. Patent filed April 2010 (Pending). Ryen White, Susan T. Dumais and Jaime Teevan. Domain Expertise Determination. Patent filed April 2010 (Pending). Jaime Teevan, Susan T. Dumais, Daniel J. Liebling and Richard Hughes. Identifying Changes for Online Documents. Patent filed June 2009 (Pending). Danyel Fisher, Jaime Teevan, Steven Drucker, Edward Cutrell, Gonzalo A. Ramos, Joseph Pitt and Paul Andr�. Visual Summarization of Web Pages. Patent filed September 2008 (Pending). Eytan Adar, Jaime Teevan, Susan T. Dumais and Daniel J. Liebling. Relating Web Page Change with Revisitation Patterns. Patent filed June 2008 (Pending). Eytan Adar, Jaime Teevan, Susan T. Dumais and Daniel J. Liebling. Using Web Revisitation Patterns to Support Web interaction. Patent filed June 2008 (Pending). Jaime Teevan, Susan T. Dumais, Daniel J. Liebling and Eric Horvitz. Using Variation in User Interest to Enhance the Search Experience. Patent filed June 2008 (Pending). Meredith Ringel Morris, Jaime Teevan, James W. Mickens, and Saleema Amershi. 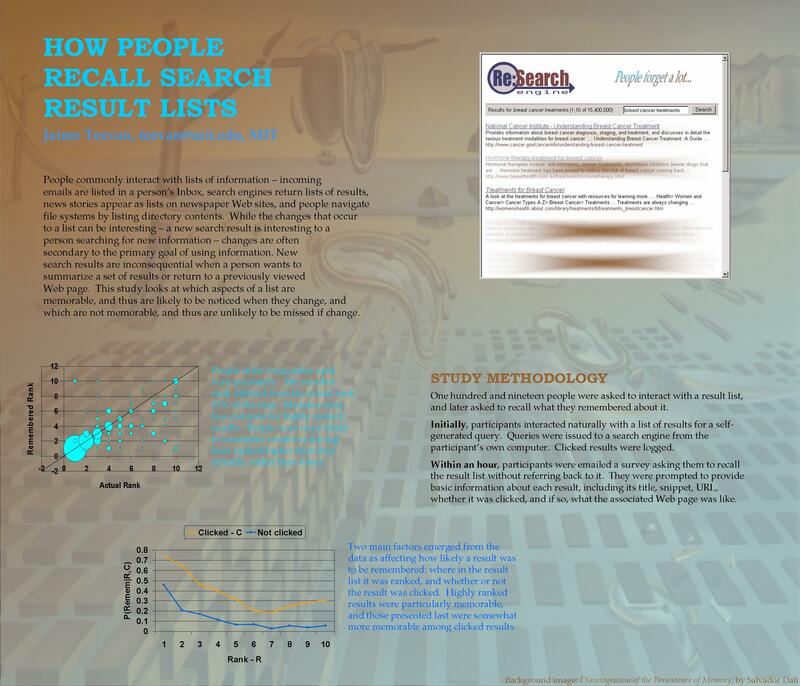 Using Related Users Data to Enhance Web Search. Patent filed February 2008 (Pending). Jaime Teevan, Susan T. Dumais and Eric Horvitz. Systems, Methods, and Interfaces for Providing Personalized Search and Information Access. Patent filed October 2004 (Pending).